Our product range includes a wide range of load rails, needle rollers and cam follower. Osborn Load Rails are hardened on the rolling surface to 60-65 Rc and offer rail loadings of up to 71,500 lbs (317450 N) per roller. 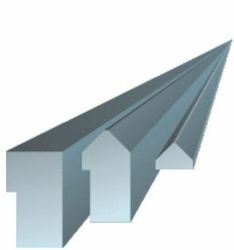 To specify a part number, replace the "XXXX" with the track length dimension as follows: the first 3 X's are length in whole inches up to 144", and the last X is fractional length in 1/8 inches i.e. 6 = 3/4". Then attach the mounting option code. For example, to specify a 4" high V-track 28-1/2" long with a clearance hole for a cap screw, the part number is: LRTV-20284-1. 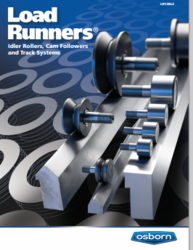 The Osborn Load Runners team produces a full line of ball and tapered roller bearing cam followers engineered to the highest quality available. Our broad selection of stud or yoke type cam followers are designed to produce minimum friction, enabling them to work with the most extreme Industrial linear motion and architectural engineering applications. We construct cam followers with materials and finishes specifically designed to meet the diverse needs of various applications. Osborn has what you need to Keep Rolling™. Looking for Osborn Load Runners, Idler Rollers & Rails ?